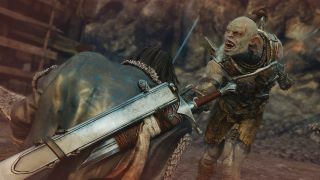 We first got to play Middle-earth: Shadow of Mordor in May, but back then we weren’t playng it on the almighty destroyer we fondly call the Large Pixel Collider. With the resolution at 1440p and all the settings on ultra, we wanted to see just how good decapitating orcs could look. Want to see more from the LPC archive? Check out some of our other recent videos: Fifa 15, Ryse: Son Of Rome, Metro 2033 Redux, Deus Ex, NeoTokyo, Watch Dogs, Wolfenstein: The New Order, the Titanfall beta, Max Payne 3, Metro: Last Light, and Arma 3. There's a lot more where that came from. Have a game in mind you'd like to see the LPC take on at ultra settings? Tell the LPC directly on Twitter.